I wired mine using my old appradio bypass . I can watch video while sitting still and low speed . Once I start moving like 5mph + it blacks the screen out and displays safety message . The VSS isn't hooked up , so how is it determining speed ? I have the same problem, even though I installed the MicroBypass. 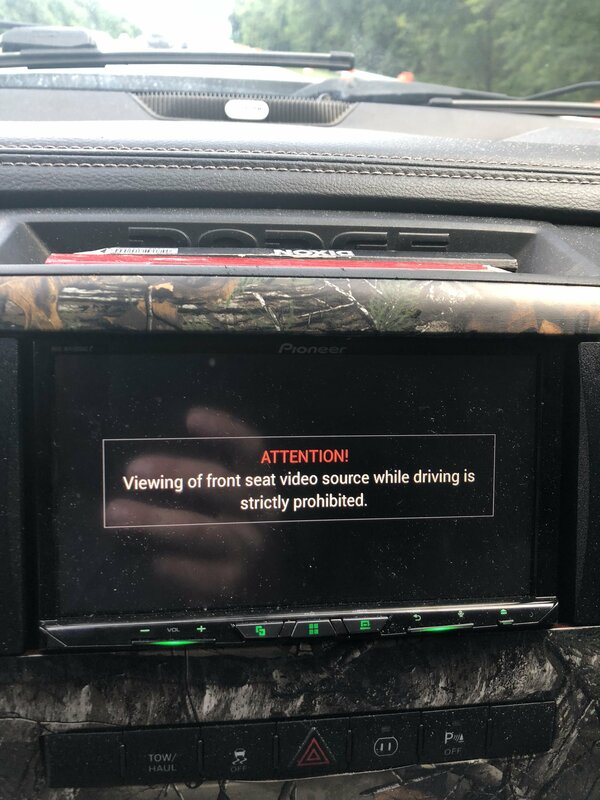 And the AVIC hold the screen to disable does not work here. Hey guys, I just took my unit out, disconnected the GPS and connected the parking brake wire to a switch that is grounded . I start the car, flip the switch on then off and can now watch my videos without my screen blacking out!! How did that effect ur GPS signal? I tried unplugging the gps antenna it did work until you lanch google maps or apple maps which uses the phones gps. Once the phone connects the same screen comes back once you reach 5+ mph. So that solution is not the answer. Has anyone tried moving the MUTE (YEL/BLK) wire to the only other open pin location & grounding it yet?? Like the older AVIC units were. What do you mean? What pin? And what would grounding it do? I finally got around to trying my idea....it sends the radio into "AMP ERROR" mode....so that's a no go. I put the pin back to its original location, removed all power from the unit, hooked it back up, the "AMP ERROR" was gone, & the radio went back to normal operation. only for AVIC of all versions. for 4000/4100/4200 the check was only for the parking brake. I ended up returning my AVH-W4400NEX and getting the AVIC-W6400NEX now I have video in motion. The screen is a little smaller but definitely worth the tradeoff to be able to have video in motion. Now all is well in the world.